Singer Charles Aznavour at President's Residence. In today's program, undisputed expert Professor Shuftan discusses what we can learn for the present situation from the Arab attitudes after the 1967 Khartoum Conference. Professor Shuftan speaks in easy to understand every-day language about this important facet of the Israel- Egyptian dispute and draws interesting conclusions. Also: After heavy politics it's time for an entertaining segment. Renowned singing star of the 1960's and 70's, Charles Aznavour (93) is awarded the Raoul Wallenberg Medal for saving Jews in France during WWII. The event took place at the President's Residence in Jerusalem. 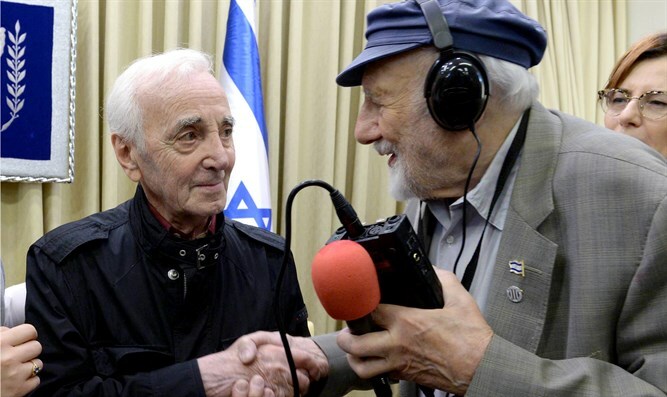 Hear what Aznavour said to President Rivlin and what the President replied.